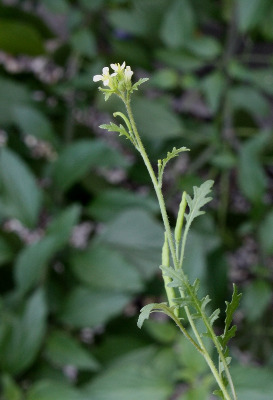 A Eurasian weed, naturalized in North America. Although known in Michigan as long ago as 1837 (collected by the First Survey on a dry roadside at Ann Arbor, Washtenaw Co.) and widespread in the state in roadsides, fields, railroads, vacant lots, farmyards, disturbed forests and banks. The fruit and axis of the inflorescence may be either glabrous or pubescent. MICHIGAN FLORA ONLINE. A. A. Reznicek, E. G. Voss, & B. S. Walters. February 2011. University of Michigan. Web. April 26, 2019. https://michiganflora.net/species.aspx?id=682.